Centuries ago, Cordyceps Sinensis was the miracle, cure-all panacea which was exclusive to the Chinese Emperors. This was mainly due to the exorbitant value of the herb as it could only be harvested from the high altitude of its natural habitat. Through the years, technological advancement from modern medicine and the breakthrough of technology contributed by the study of biotechnology has made this miracle herb accessible to all walks of life. However, as modern societies begin to practice the replication of Cordyceps Sinensis, many wonder the adverse effects of the artificially grown herb. The first cultivation of the fruiting bodies product of was discovered by the Microenvironmental Control Technology Research Centre of Research Institute of Tsinghua University, Zhejiang Yangtze River Delta. In a nutshell, the university founded a way to reproduce the natural growth environment of the asexual Cordyceps Sinensis, using the correct and proper processes to obtain the same extract and nutrients as that found in wild Cordyceps Sinensis. The years of research and scientific studies has proven that the characteristic and nutritional components of cultured Cordyceps Sinensis are the same as the wild Cordyceps Sinensis, if not higher. Additionally, studies show that it can be cultivated to produce spores which are the elite of Cordyceps Sinensis. 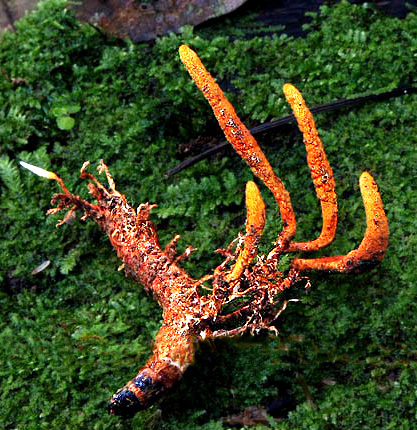 The cultivation process involves the replication of the growth environment of Cordyceps Sinensis. Traces of neither additives nor preservatives are detected in the fruiting bodies of the artificially cultured Cordyceps Sinensis. Like its wild genesis, the cultured Cordyceps Sinensis does not contribute to any adverse or toxic side effects. It has, however been successfully established that it is easily absorbed by the human body, enabling faster and more effective results due to its miraculous elements. Today, there are about 300 species of Cordyceps distributed throughout the world with almost 60 species of the wild Cordyceps Sinensis resources found in China alone. The most representative of the species which possesses the highest medicinal values are Cordyceps Sinensis and Cordyceps Militaris.